So how in the world did another year go by so quickly. It just seemed like the 2009 workshop just happened and now this year's has already wrapped. Well even though the class maybe over the memories and the baskets will live on in our hearts for years and years to come. Everyone made beautiful baskets, ranging in size from less than 2" in diameter to over 19"! 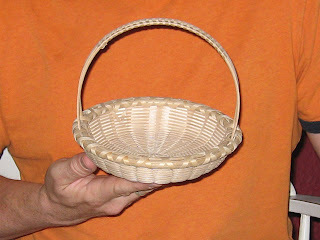 The baskets I made this year were on the smaller end of the scale, ranging from 4" to 6". One of the more interesting baskets that I made this year was a small Bushwhacker friendship basket. I have a couple full-sized antique versions in my collection and Martha challenged me to figure out how to make one. She had always wanted to make one, but as so often is the case just never set aside the time to do it. 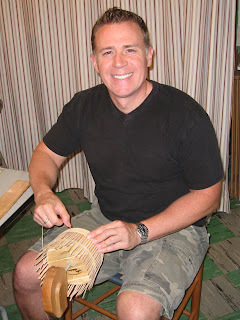 So, we figured out what materials we should use and off I went with my antique basket to reproduce something that was woven almost 100 years ago. The hardest part was making the rims since we didn't have any the appropriate size. I happened to have some white oak which I was able to steam, bend and shape into something that looked pretty much like the original. Both Martha and I were happy with the way it turned out and she is now excited and motivated to someday add this basket to her teaching schedule. A friend of mine got me into wet felting awhile back. She was making beads for bracelets and necklaces and they turned out really well. I thought it was such a cool technique, but I really didn't know what I was going to do with it though. Then I made a 2.5" kittenhead basket with a sawtooth rim and new I had found the perfect use for new found craft. I have ended up using a combination of needle and wet felting to make these pin cushions. After making a core of plain wool I then add a layer of space dyed wool which I tack down with a felting needle. This makes the wet felting step a bit easier as I don't have to worry about my final layer shifting around on me too much. Of course judging the final size is a bit of a trick as the volume of wool reduces dramatically as it felts together. I have had this shelf for awhile now and am finally getting it up. 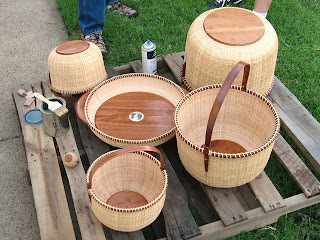 I was also able to get some baskets out of storage that I hadn't been able to display for lack of space. 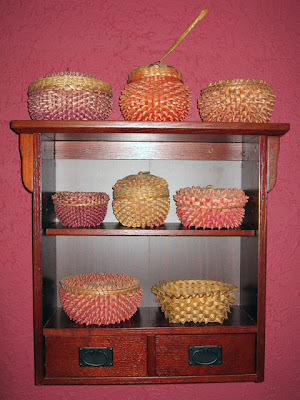 These are more of my collection of strawberry baskets and other Native American curlicue baskets. The are all woven of brown ash with sweetgrass accents and a few include some braided Hong Kong grass.